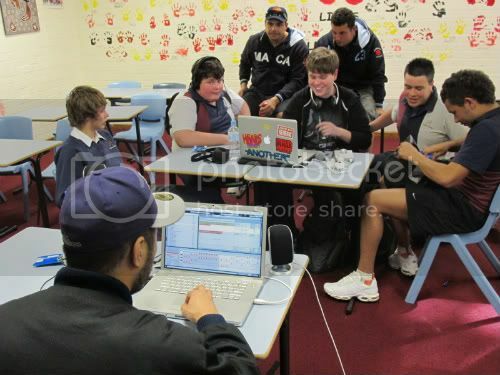 “I was quite excited to be able to be apart of some Heaps Decent workshops on my recent trip to Australia. We got a call from Levins asking us to join him in Mt Druitt and Shalvey. 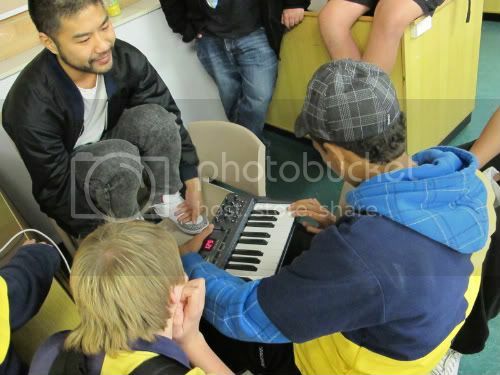 I jumped at the chance and headed about an hour outside of Sydney with Wax Motif and Levins to take part. I’ve often felt like I should be doing more for the world than simply playing records, and I have a soft spot for children, so the chance to work with the Heaps Decent crew was a no brainer. My excitement then turned to slight concern; what was I going to be able to teach the kids? Would they care what I had to say? Any concern fell to the wayside as soon as we got to the classroom. WIth the help of the Miimali Aboriginal Youth Association, we gathered the kids, set up gear, and got to work. 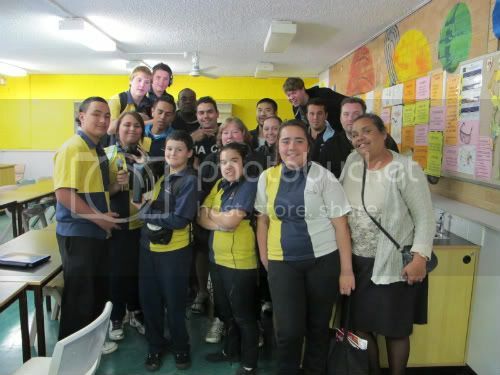 The first stop was at Chifley College in Mt Druitt. At first the kids were very shy. You could tell they were all intrigued by what we were doing and setting up, but at first, they were slow to participate. 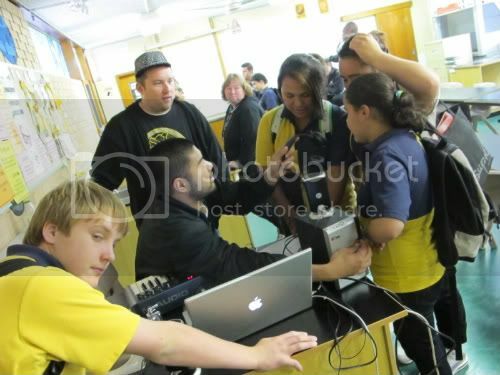 But slowly as we urged them on, one would start, then another, and as the keyboard was passed around the kids got more into it and knocked out some nice drums and a cool melody for their beat. We then split into 2 groups. Most of the boys went with Levins and worked on raps and recorded some too, while most of the girls stayed with me and Wax Motif, and we worked on a chorus which they sang. Again the girls were shy to start, but as we wrote the lyrics and started to sing, they eventually joined us. By the end of the session they were all singing together and the hook was strong! They sang about the boys in class who werent heeding the house rules – no hats! It was so cool to see the transformation from shy students to excited and enthusiastic singers! The next stop was Chifley College in Shalvey. This group of kids was more seasoned and used to making music and recording. We got there and Levins surprised one of the boys Corey with a box of lollies which he shared with everyone in the class, giving them all a massive sugar high. Then we got to work. 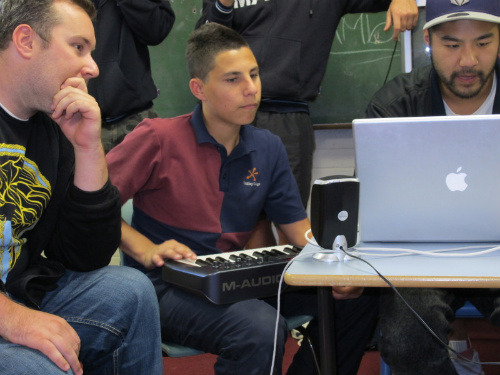 There were 2 Coreys in the class that really jumped to it, one was a master of the keys and worked on a great beat with Waxxy, while the other started a new rap over the beat they made last session. It was amazing how natural the class seemed. Their flow and timing was on point, and they had thumb drives to copy their work on after. So cool! 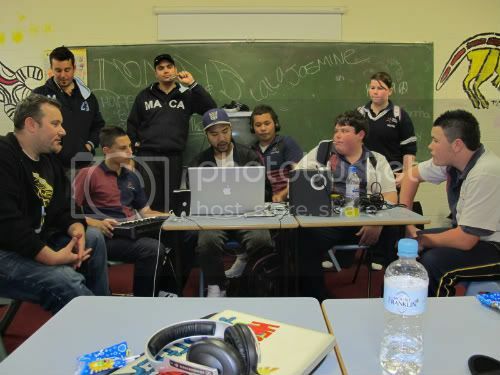 Thanks so much to Neoteric for joining us at a full day of workshops, and for our boy Wax Motif for coming along too!